The most simple controls are simple push buttons. With Lightroom you can use these for tasks like applying a rating, switching to certain panels, activating modes like crop, spot healing, brush,… and so on. In addition, the software MIDI2LR allows loading profiles by pushing a button. Every profile represents a different set of function assignments. So you can re-define all assigned functions for multiple different use cases. For example imagine one profile for the library module, where the controls have different functions like supporting culling. With a single button press, you can then switch to another profile for the development module that opens the development module and changes the controls for photo editing functions at the same time. Buttons can send two types of MIDI messages: toggling states and momentary signals. Usually, MIDI controllers come with software that allows you to customize functions of a controller. For MIDI2LR make sure that all buttons are set to momentary signals. In MIDI terms a command sent by a button is called ‘note’. The other major types of controls, faders and knobs we discuss next, are called ‘encoders’ and can sent a number between 0 and 127. Such encoders are also called continue controller or control change and their commands are therefore called ‘cc’. So why is this important? As soon as you start MIDI2LR you will see the terms ‘note’ and ‘cc’ as MIDI commands, when you start mapping functions. 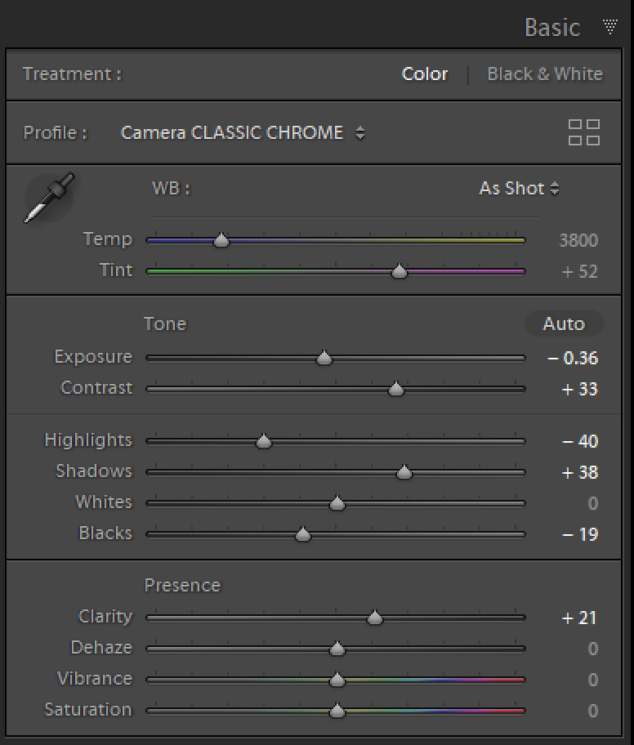 Faders (also called ‘sliders’ very often) can be used to change adjustment values like exposure, white balance, shadows,… and so on: essentially every adjustment value that is represented as a slider in Lightroom. At a first glance, faders seem to be the most natural and best way to change values as Lightroom displays most settings as sliders. The current slider position will always reflect the absolute value. For example, when a slider like the one illustrated above is positioned at a position of 75% it will always translate to an exposure value of +2.50 EV in Lightroom. Motorized faders work very well in this case. Motors in the faders ensure that the physical location of the fader’s thumb always matches the current value of the currently displayed picture. In case of Lightroom once you move to the next photo the motor will automatically move the fader’s thumb to the position of the current value very quickly. However motorized faders can be found in the more expensive and bigger MIDI controllers only. In essence, this renders non-motorized faders useless for Lightroom usage, so do not buy a controller with non-motorized sliders. Note that MIDI2LR provides the optional ‘Pickup Mode’ to minimize the danger of unintended changes with non-motorized faders. In this case moving the fader will not change any values until the fader has been moved to the current value. However I still consider this as a workaround for a wrong type of control just like you can use a hammer to drive a screw into wood as well. Relative knobs are the cheapest and the best solution. When you look at other solutions like Palette Gear or Loupedeck I’ve described in the first article, you’ll notice that both are using relative turning knobs or similar relative dials as well. Such knobs have no stops and will simply increase or decrease the current value just like the scroll wheel of a mouse. 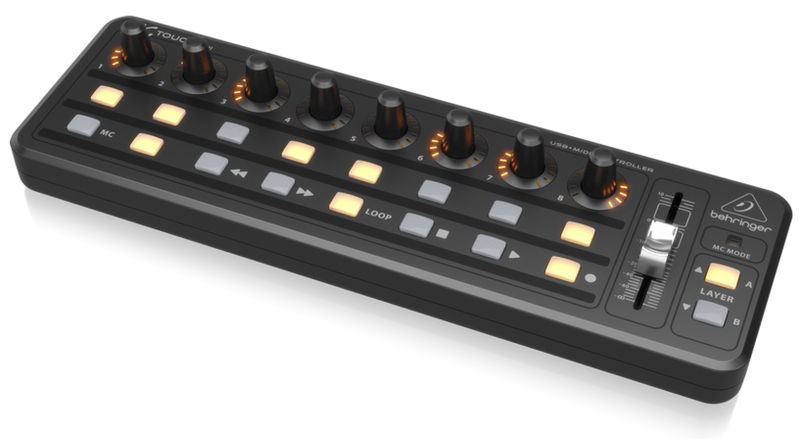 Some controllers like the Behringer X Touch Mini have dial knobs that can also act as push buttons at the same time. This is my recommended type of control as such a pushable turning knob allows you to not only adjust value by turning the knob but also to reset the same value by simply pushing it. OK, so far we have discussed the different types of controls a typical MIDI controller can provide. This should already help you to find a fitting MIDI controller on your own. Let’s have a look at a few MIDI controller that I personally consider as good candidates. It has 8 pushable knobs with LED rings – my favorite kind of control for adjustments. Below the knobs you have 16 buttons. Then there is one fader on the right, which is unfortunately non-motorized and therefore more or less useless in my opinion for usage with Lightroom. I am not using it and would rather favor to not have it at all. All controls are organized into two layers (typically called ‘banks’) that you can change by pressing the A/B buttons on the right. This allows you to allocate two functions to every single control without switching MIDI2LR profiles. So in total you have 16 knobs and 32 buttons available for mapping functions: 8 knobs and 16 buttons in layer A and another 8 knobs and 16 buttons in layer B. The Arturia Beatstep looks very similar to the Behringer X Touch Mini. But it offers an additional row of knobs, plus one larger instead of the useless slider. As far as I know, the knobs are not pushable and do not have LED indicators showing the current values, which are minor drawbacks. Also, it does not seem to have two banks like the Behringer. There are 8 additional buttons on the left, where I am not sure whether you can use these for MIDI2LR. The price of about 99 € is very reasonable. If the price is not a concern for you, you might want to take a look at the controllers Midi Fighter Twister and Midi Fighter 3D by DJ TechTools. 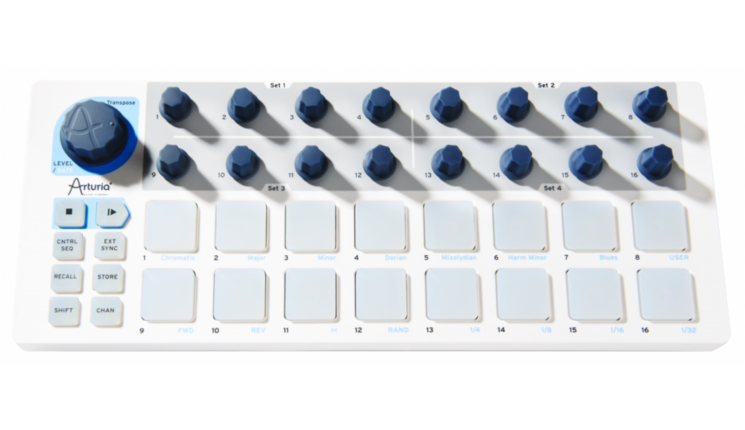 The Midi Fighter Twister offers 16 turnable knobs that are also pushable in four separate banks (64 knobs in total without having to switch a profile). What’s unique here is that you can configure the color of the knobs’ illuminations individually. For example if you want to assign color adjustments, each knob can be illuminated in the color of the actual adjustment. The Midi Fighter 3D supplements the Twister with 16 Buttons that are also organized in four separate banks. Also here you can change the color of the illuminated buttons. It also has motion detection, which might not be useful for this use case, however. If you are lucky you might be able to get the cheaper previous version Midi Fighter Spectra, which just had the buttons without motion detection. I don’t have any doubts that both devices are made of the highest quality. Now imagine the Midi Fighter 3D with its buttons below your left hand to switch functions and the Midi Fighter Twister with its knobs below your right hand to adjust values. I could imagine that this would make a great setup. However each controller costs about 250 €, so the total setup with set you back about 500 €. More expensive than a Loupedeck controller while still way less expensive than a comparable Palette Gear setup. 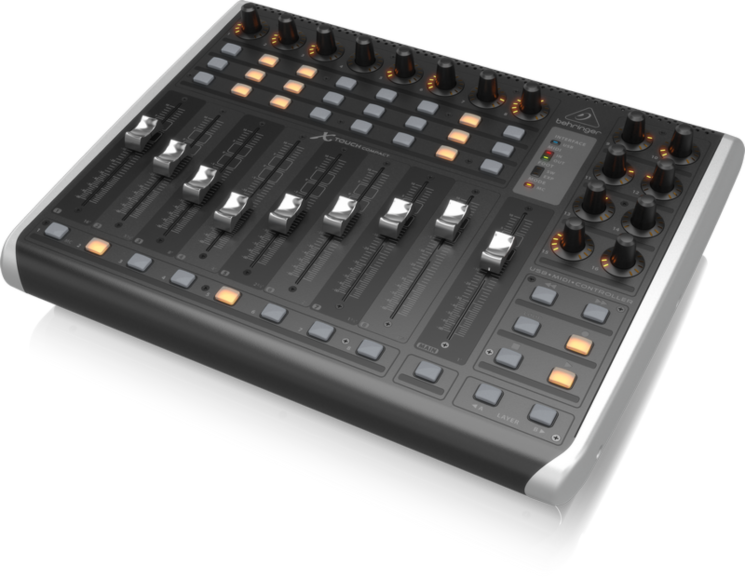 Given what the Behringer X Touch Compact provides at a price of around 300 € it looks very attractive. You just need to figure out what to do with all these controls. Also be aware that it will take away more space on your desk and it also needs an AC power connection. If you have found another MIDI controller that works well for you, please add a comment. I am eager to hear more about your setup. Introduction (part 1/3): This article: Why you should prefer physical controls and what are the alternatives. 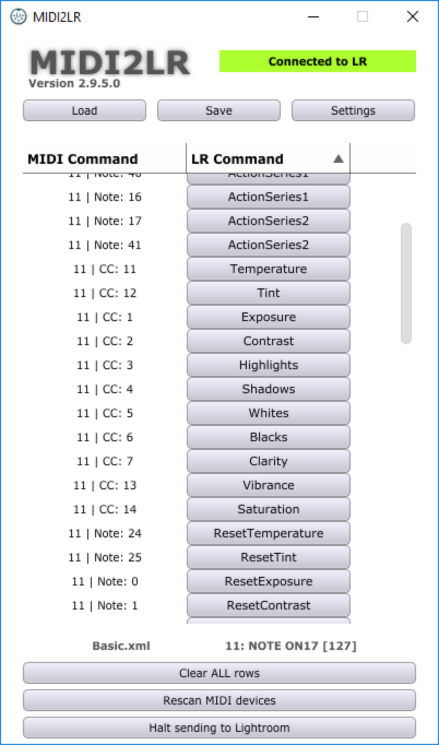 My MIDI2LR Setup (part 3/3): My configuration for the Behringer X Touch Mini including overlays. Carsten Schlipf is a photographer and a hacksmith based in Germany. You can read more of his thoughts on his web site. This article was also published here and shared with permission. I have Behringer X-Touch Mini. When I press a button (Note) to load a profile, the button lights on only when I press and is light off immediately after. Is it a way to have the button light on ?